In April, I lodged a Freedom of Information request to NBNco via the Right To Know website, which is an online tool that makes all FoI requests, communications and information released visible to the public. I had requested the details of the progress of the rollout over all three of the connection methods – Fibre, Fixed Wireless (LTE) and Satellite. If you want to view my request, you can because it is public! Check it out here. Under the Freedom of Information Act, authorities that are requested to provide information have 30 days to respond to the request, and either provide the information, or deny it along with the determination why the request was denied. There is also provisions to delay the release of the information. 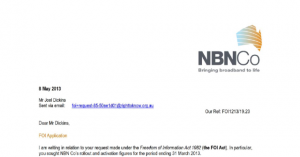 NBNco were due to respond to my request by the 8th of May. 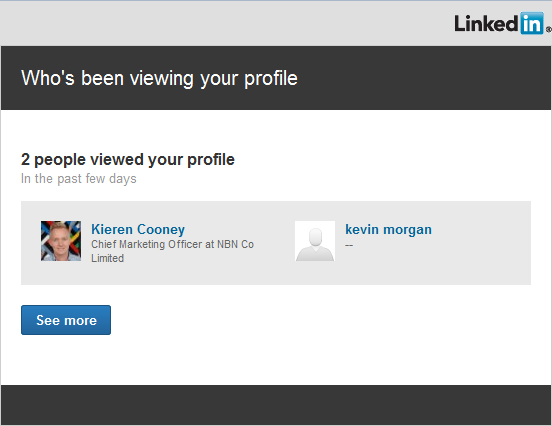 I left work at 5.30pm and headed home, pretty sure that NBNco would not respond to me request in the allotted time. Imagine my surprise when the response came through – at 5.59pm! Like the rollout itself, NBNco has a habit of cutting everything it does a little fine. You can read the entire determination on my request at the link, but the short version is that my request for information was denied on the basis of the fact that NBNco want to release this information publicly at the Budget Estimates hearings later this month. But rather than let me take NBNco’s thunder, they denied release now stating they will release later under the ‘defer’ provisions of the Act. So basically, they have this information but they will not release it because it is politically sensitive? Now normally I would request a review of this, however because Parliament goes back next week for Budget sittings I doubt I would get a ruling to release the information inside another 30 days, buy which time it would be released anyway. 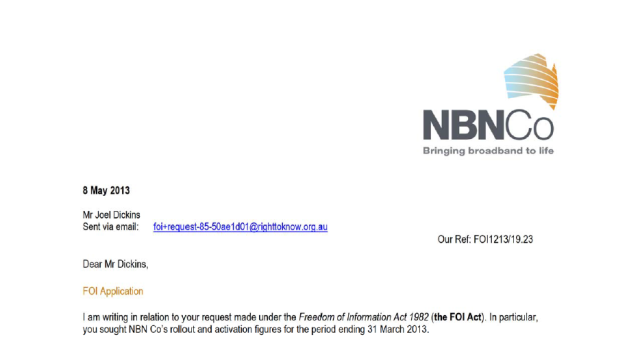 Well, the response from NBNco not to release this information (which they produce normally for end-of-quarter reports in any case) got me a little upset, so I have launched a new FoI request for the same rollout figures for as at 30th April, 2013. Hopefully this means that the Whirlpool community which is very active on the NBN, gets the monthly rollout reports as many members have requested.